Marijuana is moving from the dorm room to the classroom at Michigan universities. Two universities in Michigan’s Upper Peninsula are the first in the state to add cannabis-focused degree programs to their offerings. In Marquette, Northern Michigan University — which first launched its Medicinal Plant Chemistry program in 2017 — is expanding its lab space to be able to grow and conduct research on hemp as more students enroll. The program has grown from 0 to 240 students enrolled in two years, with a large incoming class promised for fall 2019. Across the U.P. in Sault Ste. Marie, Lake Superior State University recently announced it would be launching both a Cannabis Chemistryand Cannabis Business majors in fall 2019. Students can earn an associate’s or bachelor’s degree in the chemistry program, and can earn a bachelor’s degree in the business program. 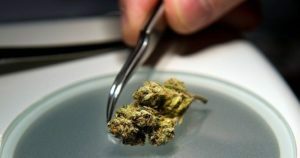 This year, the University of Michigan has also added a marijuana course: PharmSci 420, which covers the underlying biology, chemistry, pharmacology, toxicology, epidemiology and pharmacokinetics of cannabis. The degree programs at the U.P. universities have received heavy interest — both from the new medical marijuana businesses that have launched in Michigan, and from students across the U.S.
Hanley said they received their first application for the cannabis chemistry program within three hours of announcing the new major. Job prospects are good for college students with technical chemistry backgrounds in the emerging cannabis industry. The average starting salary for a cannabis chemist is $72,000, and the industry is expected to create 500,000 jobs by 2022, according to LSSU. “You simply can’t ignore the economic growth potential that cannabis may offer,” Hanley said. Marijuana remains illegal to the federal government, as it’s still a Schedule I controlled substance under the Controlled Substances Act. In order for a university to grow marijuana for research, the institution has to get approval from the U.S. Drug Enforcement Administration. To obtain marijuana for research, universities have to go through the National Institute on Drug Abuse. Hanley said Lake Superior State is abiding by all federal laws. However, the 2018 U.S. Farm Bill legalized industrial hemp — making it easier for college students to study the cannabis plant. Hanley said LSSU’s chemistry program will allow students to study both hemp and marijuana starting in their first year — a factor that he said will help them differentiate themselves from other institutions. At Northern Michigan University, construction is underway on 45,000 square feet of lab space for the program, which will include indoor growing space for hemp, said Mark Paulsen, head of the university’s chemistry department. Faculty will be able to work with hemp starting next fall in the new lab space. “Students will get training in how to process the plant material; how to extract the medicinally interesting compounds from hemp, and how to analyze the samples they’re preparing,” Paulsen said, mentioning cannabidiols, or CBD. Northern Michigan’s Medicinal Plant Chemistry program allows students to study plants beyond cannabis — like echinacea, St. John’s Wort and ginseng. Graduates from the new chemistry programs are expected to be in high demand for safety labs and quality assurance positions in any industry, Paulsen and Hanley said.